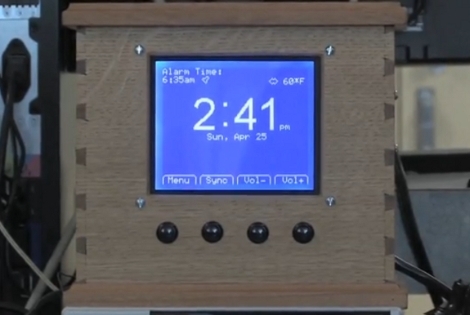 DPAC, the Dynamically Programmable Alarm Clock, goes far beyond what you would expect an alarm clock to do, yet we find all of its features useful. You can see there are four buttons at the bottom that control the menu scrolling. The second from the left currently reads “Sync”, a feature that the clock uses every 10 minutes but can be forced manually. This will check your Google Calendar, schedule an alarm for the next event while factoring in driving distance, traffic, and weather conditions. It’s got an audio system for radio and iPod operation, but also includes some home automation options. Using the X10 communication protocol it can turn on lights, start the coffee maker, and open the blinds as part of a gentle wake-up cycle. All of this is configurable through the clock itself, or via the web interface. The prototyping was done on an Arduino but the final version uses an AVR ATmega324 along with a Roving Networks RN-134 WiFi module (datasheet) for connectivity. Check out the demonstration video that [Eric Gaertner] and his fellow developers filmed after the break. Well…I don’t even know what to say about this one. Just incredible. ok, it’s awesome!, but too complicated for me, i don’t need all those things. Awesome… Now I’ll read the post. For this you can use a standard digital time switch and plug the radio, lamp whatever in it then program it as u want. But can it cook bacon? Im working on almost this exact same project!!! Except I’m using my G1 cell phone for it all. Thanks guys! I wish it could cook bacon, we had to push that back to rev 2. @Anton Zalutsky How far along is Android app? I was looking at doing that next. I bet the next version will be even better. What i would add: auto dimming to turn the display light almost off when there’s no light in the room, for when you sleep and dawn simulator, to gradually light up the lights before the alarm, not turn them on instantly. Needs some more practice with those hand-cut dovetails. Awesome project! @bogdanfirst Thanks for the tips, auto dimming is definitely a feature we wanted to get in if we had a bit more time. Since we have the manual controls, it’s only a photodiode away! I forgot to mention it in the video, but we do have sunrise simulation working, over about a 10 minute span. I just disabled it for the video to speed things up. awesome project! if i had the time, i would definitely try and make something like that. though i’m still set on the nixie clocks (one is on my list to make), and will probably at least try and integrate zune control into mine to wake me up a bit. how does it keep time? i’m considering the gps route, but i would probably need an external antenna and all that jazz. oh yea, many props to you for using the arduino for its intended purpose: as a prototyping device, and not as the final controller.